Good morning all! 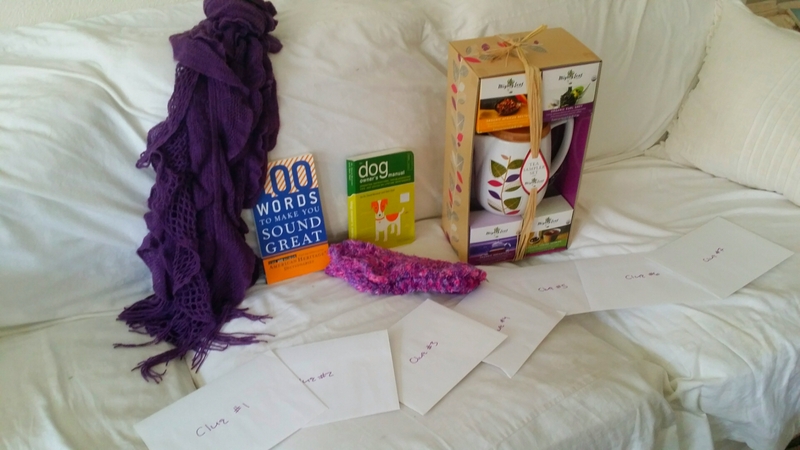 I’m finally getting around to taking the proper time to make a post about my fabulous birthday treasure hunt created by my darling friend Mya before Thanksgiving. And pure magic it was, pure. Mya and I take at least one day per month to offer what’s called “co-treatments” in our therapeutic modality, Myofascial Release. 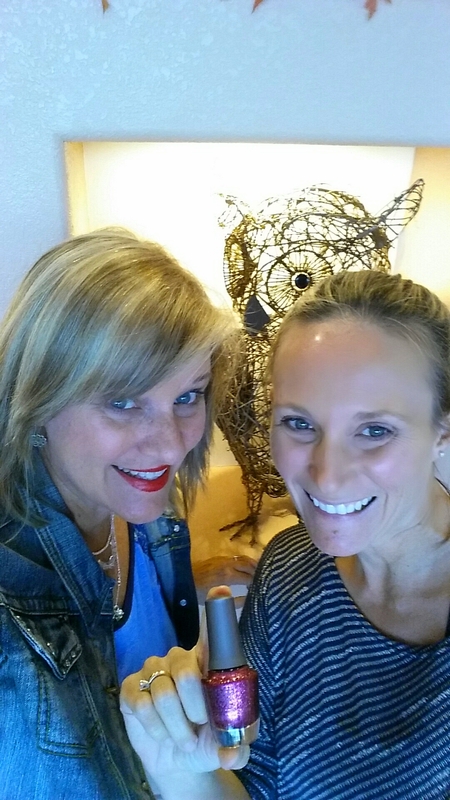 This means we get together at her office and work on patients together (two on one) all day. It’s amazing for us, for them, for the world. 😉 It’s just a great opportunity and I’m very very fortunate to have it. We get along like peas and carrots. We work so harmoniously together it’s almost scary. 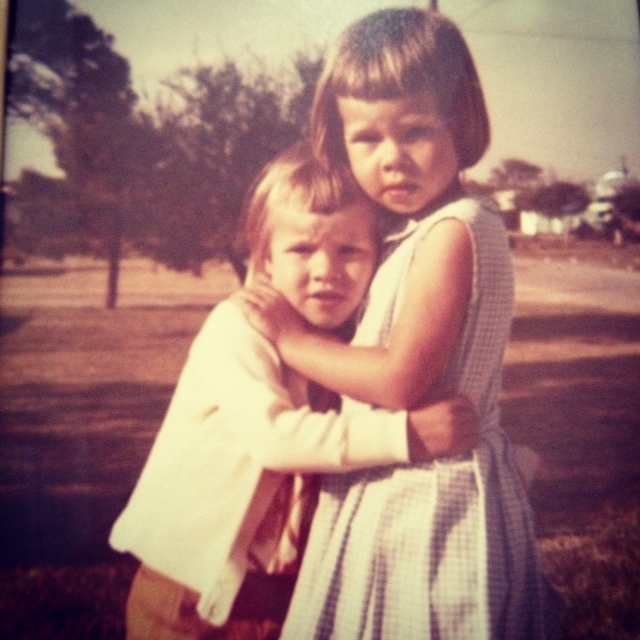 We have never had one power struggle or conflict…we trust each other and just flow. I think this is why the therapy is so deep for people because we become four hands from the same therapeutic body. I learn from her, she learns from me and everyone wins. We also have developed a very very close bond personally. Mya is one of my friends who despite having a very very busy life with a business/practice and two young children, always makes time for me. I am typically revolving, being single and without kids, around other people’s schedules as I’m just more flexible. But I have a couple of friends who prioritize me in a way that just feels, well special. The tale I’m about to tell involves that but in such a huge momentous way, it’s hard for me to believe but I believe it. Maybe this is why it’s taken me a few weeks to write it up…maybe I’ve needed the time to digest it. That Friday was like any other co treatment day but we decided to get together after work and go celebrate my birthday a couple of weeks late (I was out of the country the week of my birthday as you may recall). 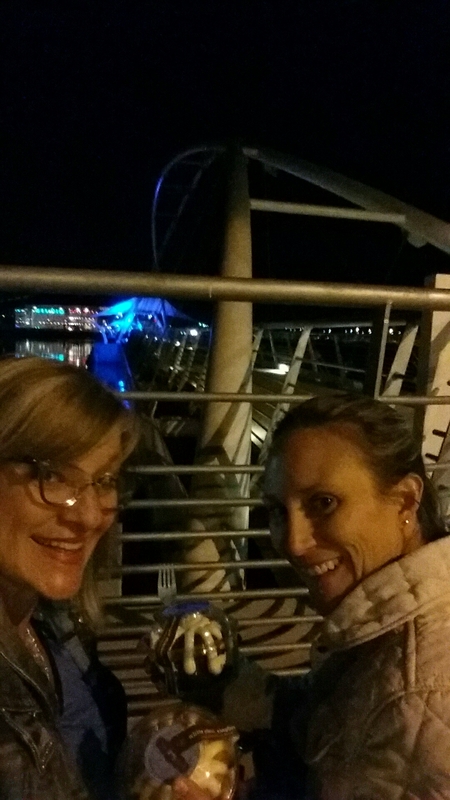 She asked to get together and easy peasy we were already together so it was perfect timing. I thought we’d treat til 1:30 then head over to our favorite local hangout the Crepe Bar for lunch. Perfect! Oh no, this chick had other ideas and plans and magic up her sleeve. I asked if we should go in separate cars or what and she sneakily said “no let’s go together in my car, let’s just go out and sit for a moment and decide where we want to go”. “No problem” I said. I had been following her lead all day, why stop now? 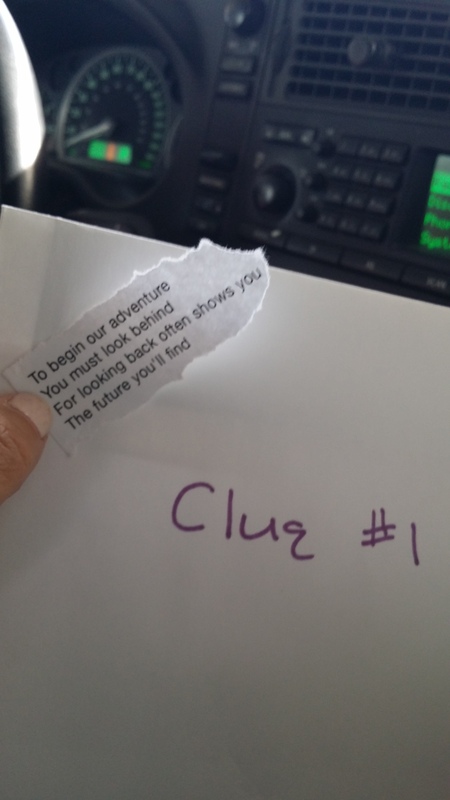 We climb in to her little sports car and sit and she pulls out this envelope that says Clue #1. “Huh”? I think as I see this sly little grin on her face. I knew she’d done this recently for her daughter’s BD and so wanted to participate but was in Sedona. She was doing this for ME! 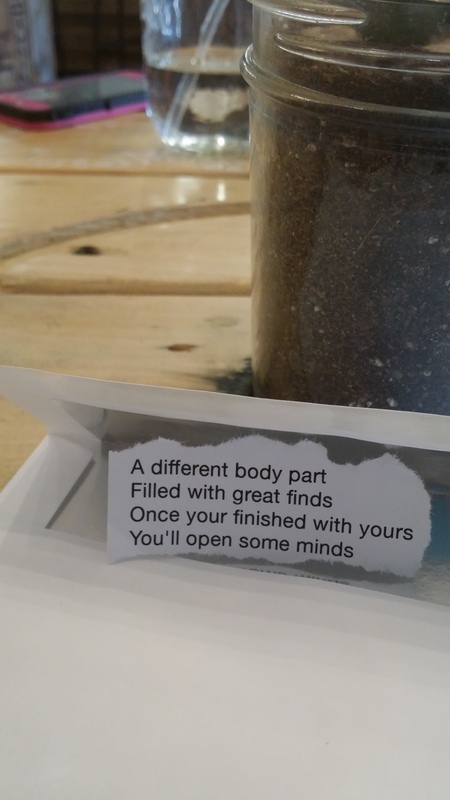 So I opened the first clue which was mysterious but I eventually figured out we were going to a restaurant for lunch called the Pomegrante Cafe. I’d been wanting to go there forever. 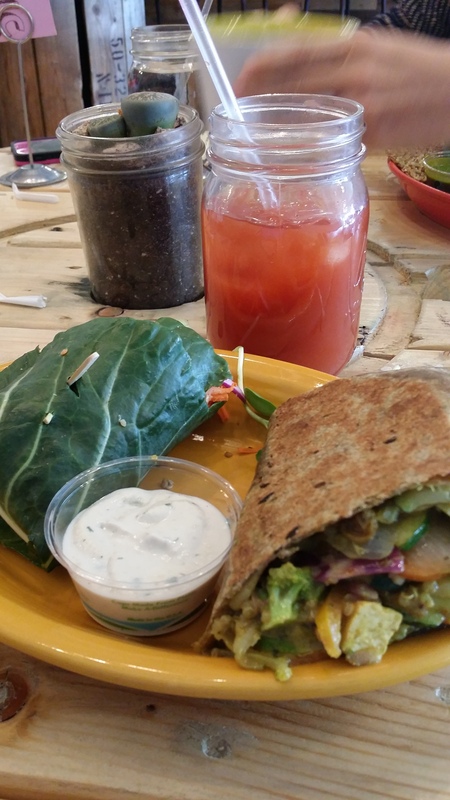 Healthy fresh cuisine, nearby. 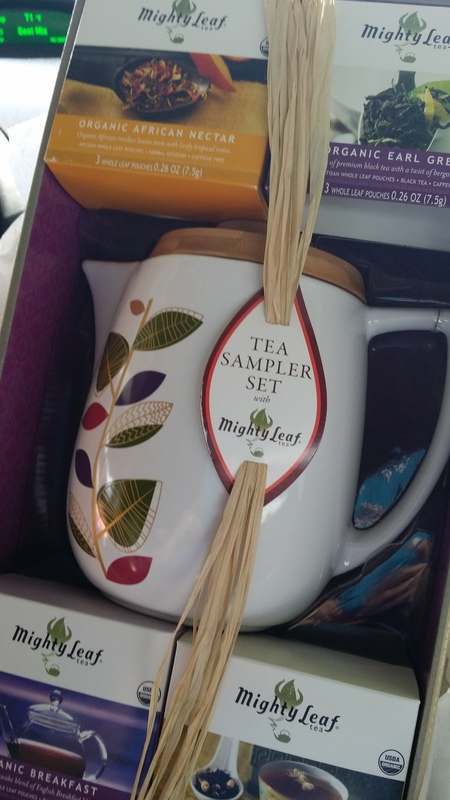 Before we pulled out of the parking lot though, she reached back and handed me a big bag with this wonderful gift inside. 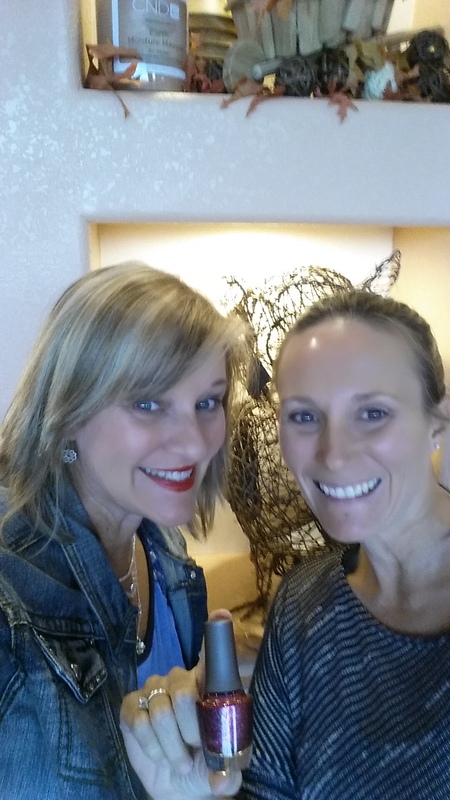 We had a delicious leisurely lunch there which I was thinking was the whole day until she pulled out Clue 2! AND another present! I finally guessed the next stop…my favorite local book store, near my house. We drove there and she said “you have something waiting for you at the desk”. 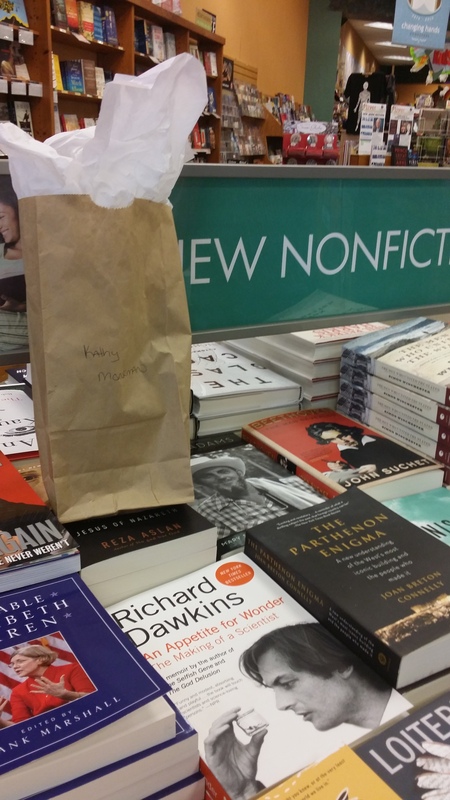 I went up and they handed me another bag with two books in it–one related to writing and one related to dogs–my two big goals in life. This girl pays attention! 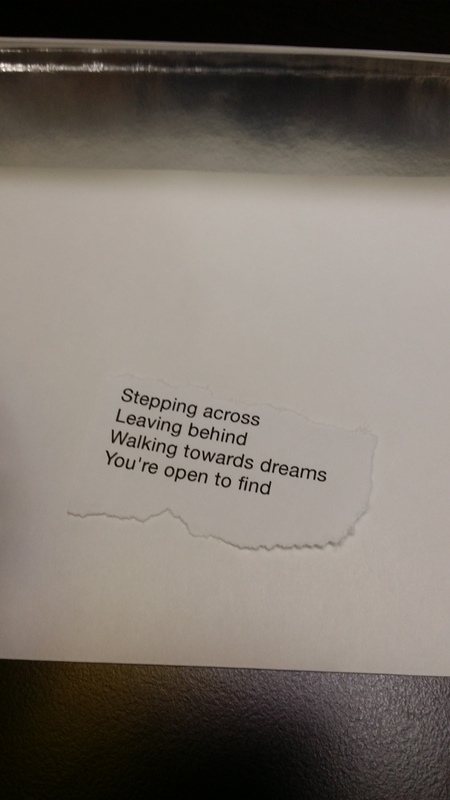 And then yet another Clue surfaced! This one was right next door…my favorite nail salon and we got matching pedicures. 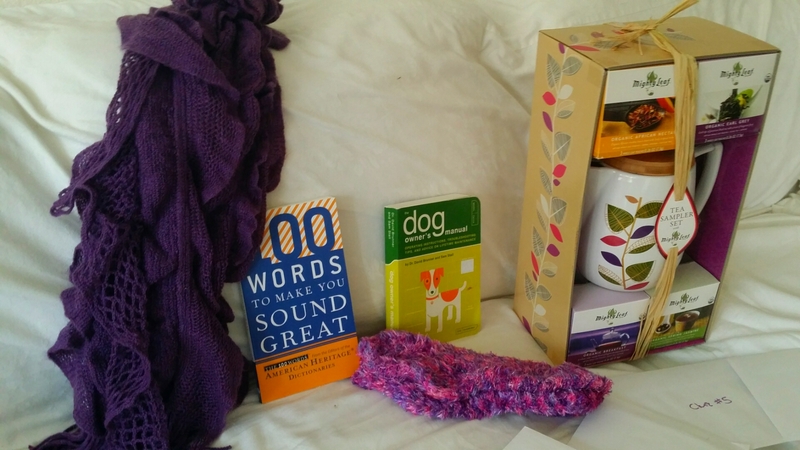 And you guessed it–another present, some fuzzy socks and another clue! I could hardly believe it…this was a HUNT full of TREASURES the most being the time I was getting to spend with this beautiful creature called Mya. 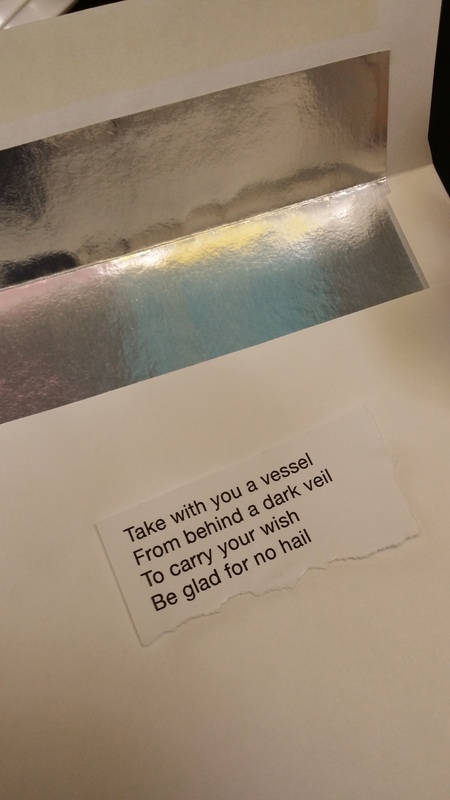 According to the nail salon clue, I figured we were headed back to her office where my car was parked in full circle. The final chapter of this magical mystery tour. Oh no…another clue when we got there…in fact TWO more! I was searching for a dark veil and looked behind her curtains then remembered a little storage space she has behind another curtain and there it was, a bouquet of balloons! 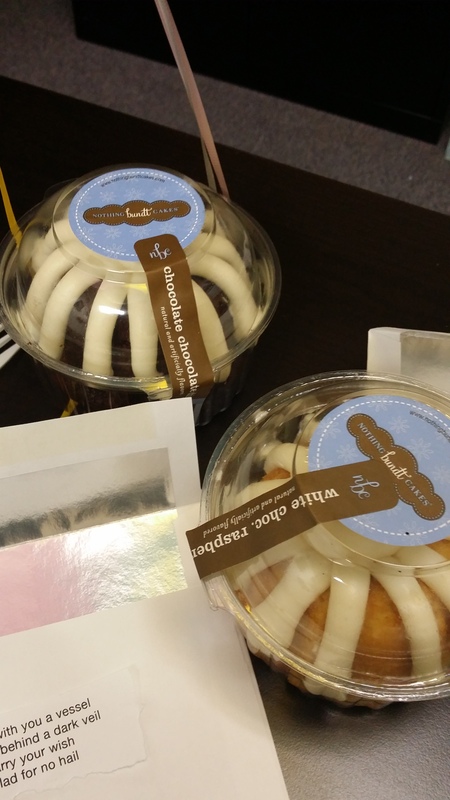 And in the refrigerator two single bundt cakes! Yay, the birthday party was complete! 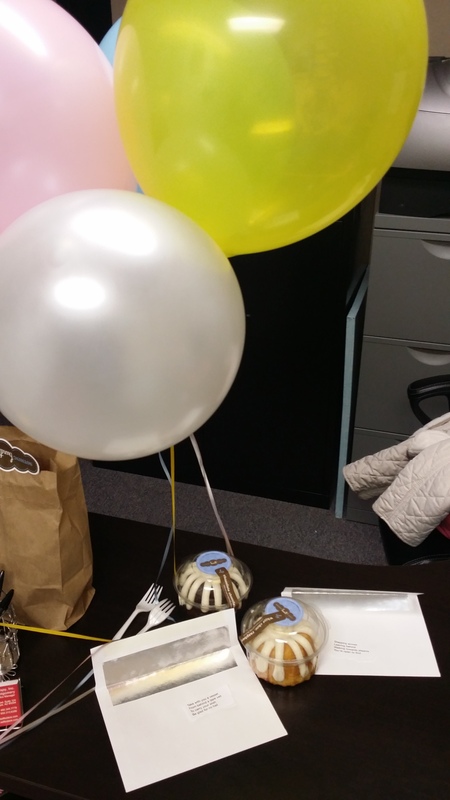 Balloons and cake shared in her office. Oh no…………I was wrong, so premature! There was yet another clue and we were back on the road again, guess where? 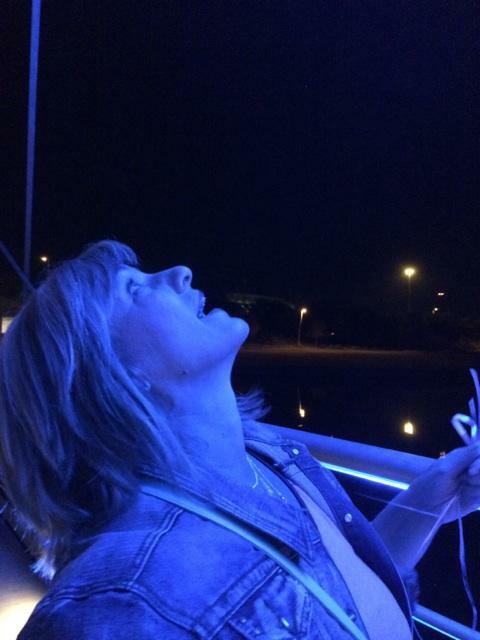 Everyone who knows me kind of knows of my magical relationship with the Tempe Pedestrian bridge. It’s a portal to another dimension for me. 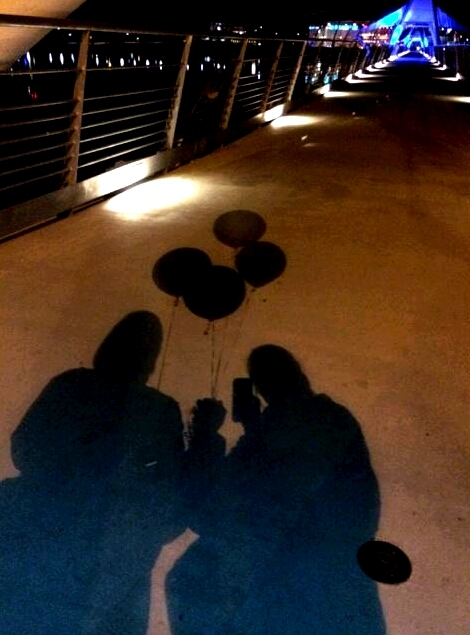 I’d never been there with Mya yet so off we went, balloons and cake in hand, to the bridge. And she had a plan. Once we got over there, there was some huge music festival going on so my regular parking lot reserved and people people people everywhere! Then I remembered a sneaky parking lot on the other side of the lake I go with my client who takes me kayaking. It’s right by the beach where we launch the boats. Mya and I found it and quickly named it “The Sketchy Parking Lot” because at night it’s very very different. It’s under the freeway and you just feel the nefariousness that’s going on there. 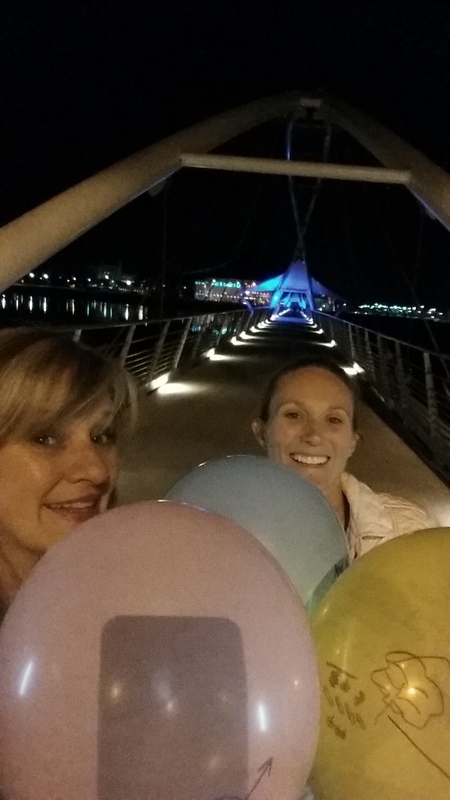 We paid no nevermind, armed with cake and balloons, we headed for the bridge. We sat for a moment then she told me her plan. 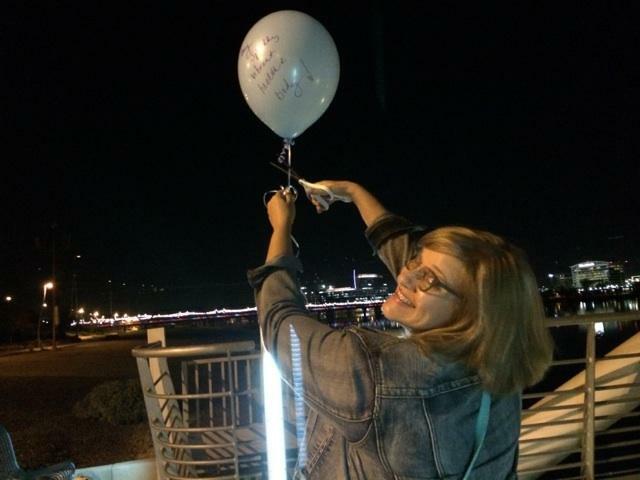 I was to write things with a Sharpie she’d also brought, on the balloons then release them on the bridge walk. My usual bridge ritual involves walking one way releasing something then the way back filling in the spaces with something new. Now Mya added a twist. She had 4 different balloons with ribbons and also had brought scissors (this gal was prepared!) to cut as the balloons released. I thought of 3 things for myself and insisted she take the fourth. You see Mya and I were talking all day about a BIG dream she was standing right in the middle of herself. She and her husband had made an offer on their dream home that very day or at least the day before and were waiting for a response. It was on our minds all afternoon. 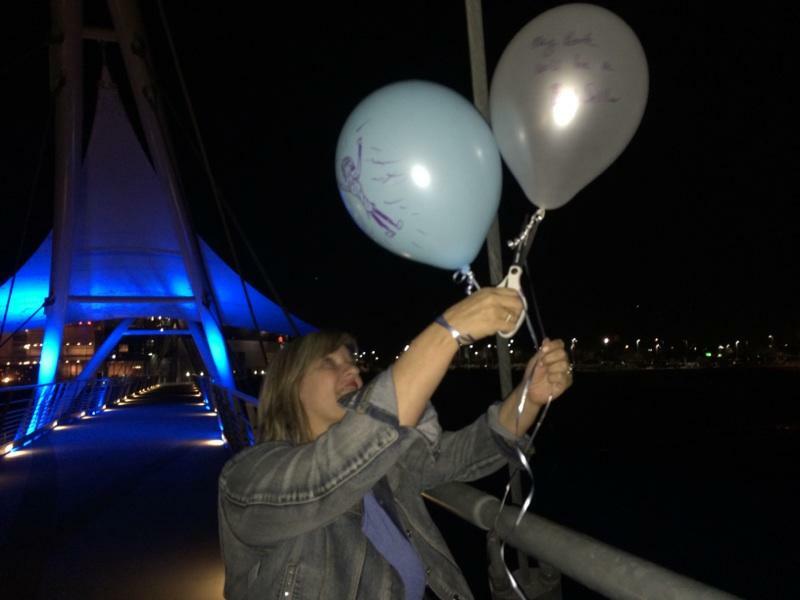 So we both wrote words and drew pictures on our balloons, then held hands as we stepped over the threshold of that bridge. We decided my balloons would represent 1. something to let go of 2. something to fill that void and 3. the biggest dream I could imagine. We decided to let the actual releasing process happen organically and magically it did unfold. 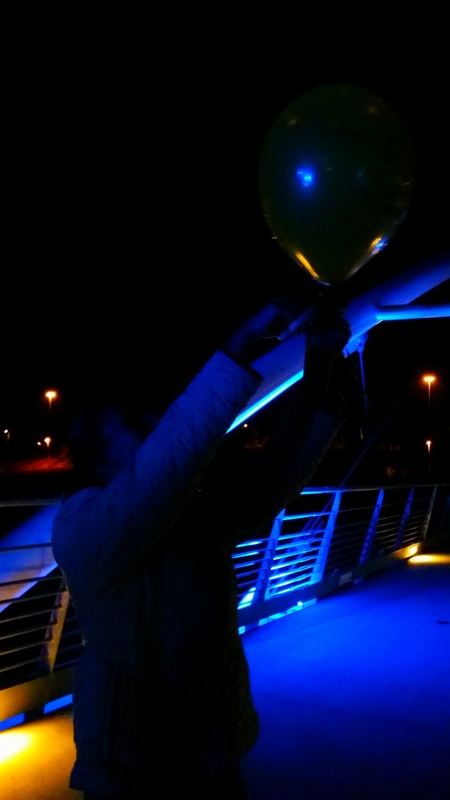 My first balloon, the something to let go of, decided to get stuck in the arch structure of the bridge. I just said “it’s ok, it will work it’s way out in time, let’s keep walking” and turned and started on. 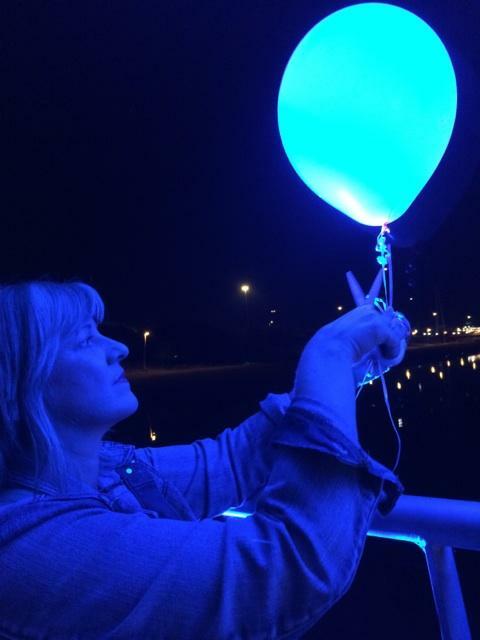 Each balloon had it’s own story, it’s own trajectory, it’s own unique way of releasing itself to the heavens. Mya’s was so astounding as we kept seeing it, in the dark, with this shining blue light embedded inside that reminded me of the third eye blue pearl remaining visible up to what looked like literally the stars. My eyes were kind of straining so I looked away to adjust them and just as I did, Mya saw that balloon burst releasing the blue pearl in to the atmosphere like a brilliant explosion of blue light. I missed it so that must have needed to be her personal message. As we walked back to the beginning, the “stuck” balloon was gone. Mya said “you just turned your back on it and it worked itself out”. I remember feeling no worry about it, just confidence it would find where it needed to be. That’s how much I trust that bridge. I aspire to trust my whole life like that. It was a very good lesson for me though to consider just turning my back on something that is a block to my growth and letting it find it’s way out. I tend to be a dog with a bone sometimes and this particular word I was releasing is one I have little control over so turning my back with confidence is something that I think will develop in me for a very long time. After walking both ways, which took significant time, we sat and ate the most delicious moist cakes I think I’ve ever had–in two flavors. We didn’t head back to the Sketchy Parking Lot until about 9:30 (scissors in hand 😉 ) but we weren’t really afraid. Mya took me back to my car at her office only to find it completely dead! The battery had just gone kaput. Way too much energy to take in I guess. She drove me home and I wasn’t even upset or worried. I went back the next day, got a new battery thankful this happened in a safe place, not on the road to Seattle in an open wilderness. And the next morning, Mya’s offer on her dream home was accepted. I really don’t think I can add anything more to that. I’ll let you know as my own dreams start to materialize although for this moment, it feels like I’m living in one big materialized dream. 55 is my best year yet, maybe ever in my entire life. Now that I think of it, my mother died when I was 5 so maybe this is some kind of do-over. I don’t know but it’s filled with miracles and love so far. I can’t wait to see what else it’s to bring. I love you Mya Swan Rueda! So much! I so LOVED going on this magical journey with you!!! Thank you for sharing such a special day with us! I love you too Kathleen Monkman!! You inspire magic. I know that is a boringly standard opening response….but what can I say?? Just, “WOW!” in the most enthusiastic sense of the word! Mya is most definitely a very special individual. I can see why she is drawn to you, and you to her. “Peas and carrots”, yep. Or, diamonds and gold! love, your timing is IMPECCABLE!!! I was so excited to see it. I had been waiting for it, and missed it by a few days, I see!